Obesity 101 offers a perspective on the complex factors that influence obesity, especially the obesogenic world in which we live. Information about how effective food industry practices as well as food advertising are in getting us to eat more and more often is fascinating and explains a lot about the obesity epidemic. The text combines current research from multiple perspectives to provide a reader-friendly overview of the history, causes, prevalence, consequences, treatments,and future trends in the prevenion of obesity. It integrates research from a range of disciplines in the biological and social sciences, as well as education and economics. 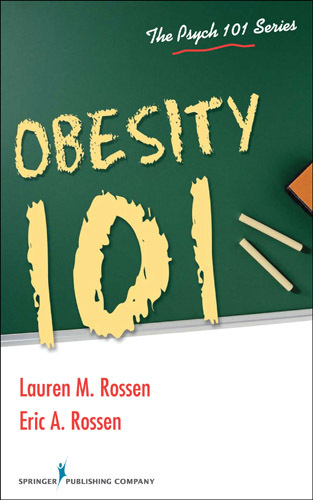 The text explores current treatments for obesity, in addition to prevention programs in schools, the workplace, the community, and the arena of public policy. Since obesity is a burgeoning problem in the developing world, as well as having already reached epidemic proportions in many developed nations, the book also discusses international trends. "Well written -- very informative." "Found myself just reading and thinking and forgetting about the quiz." "Like the textbook, easy to read and good information provided in an interesting way." "I actually enjoyed doing this study. Information was clear, up to date, and relevant to any field of nursing. The author incorporated fun comparisons and personal notes to lighten the heavy material when needed. Easy to read." "This is the best text book I have reviewed for you to date! The authors were engaging and the content was relevant and incredibly important!" "Enjoyed the text, liked the humor--made the text reading easier and enjoyable." "Easy read, almost too casual but did provide research and facts."